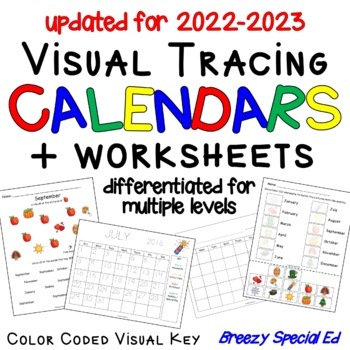 I love doing calendar activities in my special education classroom. I try to make our calendar activities as age appropriate as possible, while also reaching my students intellectual needs. I started doing monthly calendars again this past year, but this time with my lower group of students. 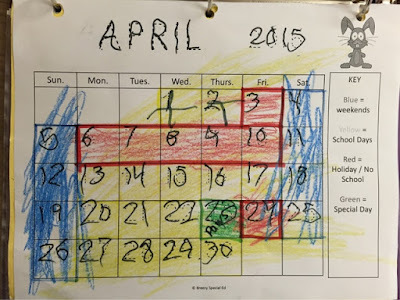 See how I did calendar with my higher students here. It took me a while to realize that my lower students could complete a similar calendar but they totally can! So we ditched the individual Velcro calendars and started this instead. It also worked out great that I got some higher students halfway through the year and this activity was easily modified for them to be more challenging as well. I color code our calendar so students can visually see what is happening that week, without the support of symbols. The color code key is simple (with only 4 colors) and stays the same, so students pick up on it relativity quickly. So you can see with this one below I outlined the dates with their correct color. This student has the tracing version and traced (with assistance) the numbers and then colored in the dates based on our key. This next student received the black calendar and was able to write in the numbers while looking at her communication device page of number to make sure they were in order. 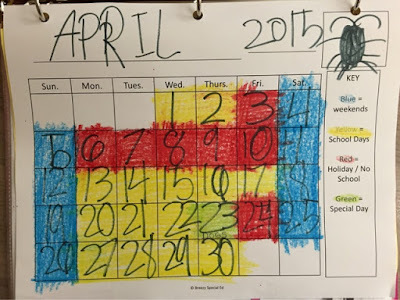 Then she was able to follow along and color in the dates as I explained what we had to look forward to that month on the board. Once students complete their calendar for the month, I have them hole punch and put it in their binder under the calendar tab. Each morning, we go to our calendar and cross off the days that have passed. It's a great visual way to see what has happened and what is going to happen each month. For additional calendar practice for my higher level students, I have a worksheet that asks questions about the calendar, such as "How many days are in this month? ", "How many Tuesdays? ", "What holidays/special events are happening this month? ", etc. All of these calendar activities are available for purchase here in my TpT store. I love using them and think you'd love using them this year too! Great idea! Also a wonderful way to introduce calendars to toddlers. I'm going to make one for my granddaughter with colors to indicate days when Daddy works, when he's home, and when Grandma (or someone else) will be coming to babysit. Yes! That's a great idea!! !